Has anyone heard or see anything published by this italian guy? I looked at his video and assorted nonsense. He will self promote his garbage endlessly like Zip. he appears to have distinctly mimicked George Haas syndrome as a Foo-dini artist. Is there any specific image that caught your eye as a good possibility Mayito? If not, he is probably just another Basiago urinating his inebriation down town in clown town. These YouTubers.... I bet he's got that site monetized, as in adsense click for pay. and trying to get a couple million views. Some of the stuff is absolutely fake. I hate to say it, but you know who came to mind when I first saw the image? But every time I begin to chuckle about these, I recall Nazca. Few I see on Mars strike with the power of Nazca, but how much washout might have occurred during the Mar's cataclysmic event? We may have to discount all but 1%, but we might cede them that 1% yet, and say "Well done". On the other hand, allow us to drop our petty coats so as to not have to drag them thru too much deep muck on the way to the gems. Some things just cry out "Pick Me", others are just fanciful dross. The video in Mayito's link had only clocked up 159 views. Another about an alien base only had a few hundred, and the ring in it could have been any size for all we could tell. The computer generated voice spieling aliens BS is just too nerdy, if this guy wants to be a YouTube millionaire he's in for a long wait. I've known of the idiot for around 3 years. His first ventures were hilarious. He joined my FB group, then tried to copy right a google Mars undoctored image, oddest behavior. . He was booted out in a heart beat. He's a glory seeking uneducated prick, and is a huge part of current issues in anomaly hunting! He's not a researcher.I would say more a chancer. 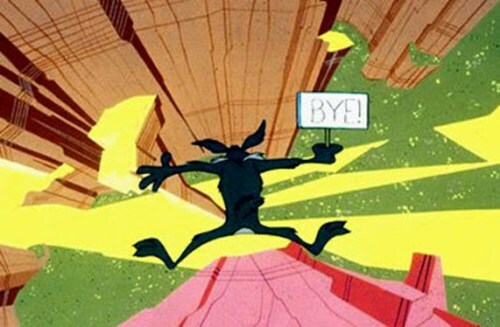 Oh, zip was booted soon after fir attempting to monetize supplied links, suprise suprise! You know the saying, birds of a feather most definitely flock together! Oh you'd be surprised how many views some of these idiots get... and even media coverage..
all it takes is a little promotion. ones like this usually don't end up doing much, but paint in a surface oddity and call it buddha on mars or a crab and it sells like crack. I thought the guy look like EA so that is why I asked if anyone knew about him. Looks like some cheesy garlic bread there . . . I for one aint surprised Keith. As you know, just look at the bear pits called anomaly pages and groups on Facebook, as an example. A mixture of hopeful, confused, ignorant, greedy etc etc. Can u imagine the kind of damage this has done to the wider publics perception of us? Rarely can those sensitive flowers be told they are wrong. Or to think rationally. Add money to the mix and u get assholes like SecretMars and others (creatively named) whom has cherry picked others investigations and charges up to $59 for his sheep to consume his Pdf docs (can't bring myself to call his plageristic outputs, books). Rather sad! But I must say amusing at times. (01-24-2016, 07:25 PM)Mayito7777 Wrote: I thought the guy look like EA so that is why I asked if anyone knew about him. (Tech Xplore)—Not all of us park our bodies in a chair in the morning and cross our legs to do our work. In fact, just think of vast numbers of workers doing physically demanding or just physically repetitive tasks including bending and lifting. • Before commencing to debunk, prepare your equipment. Equipment needed: one armchair. • Put on the right face. Cultivate a condescending air certifying that your personal opinions are backed by the full faith and credit of God. Adopting a disdainful, upper-class manner is optional but highly recommended. • Employ vague, subjective, dismissive terms such as "ridiculous," "trivial," "crackpot," or "bunk," in a manner that purports to carry the full force of scientific authority. • Keep your arguments as abstract and theoretical as possible. This will send the message that accepted theory overrides any actual evidence that might challenge it -- and that therefore no such evidence is worth examining. • By every indirect means at your disposal imply that science is powerless to police itself against fraud and misperception, and that only self-appointed vigilantism can save it from itself. • Project your subjective opinions from beneath a cloak of ostensible objectivity. Always characterize unorthodox statements as "claims," which are "touted," and your own assertions as "facts," which are "stated." • Portray science not as an open-ended process of discovery but as a pre-emptive holy war against invading hordes of quackery-spouting infidels. Since in war the ends justify the means, you may fudge, stretch or violate the scientific method, or even omit it entirely, in the name of defending it. • Equate the narrow, stringent, rigorous and critical elements of science with all of science, while summarily dismissing the value of inquiry, exploration and discovery. • Though stubborn negativity can no more be equated with science than a braking system can be equated with an automobile, insist that science consists wholly of the ruthless application of doubt. If anyone objects, accuse them of viewing science in exclusively fuzzy, subjective, or mystical terms. • Likewise, while it would be ridiculous to equate a vehicle with a particular destination, declare that "science equals the existing body of scientific conclusions!" • Reinforce the popular misconception that certain areas of inquiry are inherently unscientific. In other words, deliberately confuse the process of science with the content of science. If someone should point out that science must be neutral to subject matter, and only the investigative process can be valid or flawed, dismiss such objections using a method employed successfully by generations of politicians: simply reassure everyone that "there is no contradiction here!" 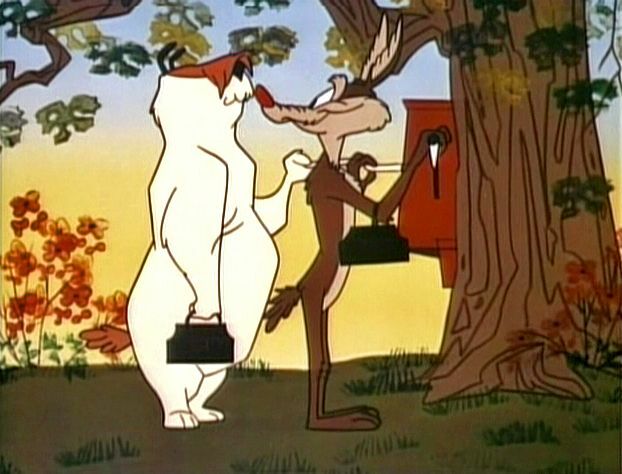 • While insisting with one side of your mouth that the scientific method is universal in its application and should be free to inquire into anything whatsoever, use the other side to deem it ineffectual when applied to unpopular subject matter. Be sure to assert, in time-honored conservative fashion, that "freedom isn't license," . . . and that "some questions are best left to the theologians!" • Declare that the progress of science depends on explaining the unknown in terms of the known. In other words, science equals reductionism. You can apply the reductionist approach in any situation by discarding more and more and more evidence until what little is left can be explained entirely in terms of established knowledge. • Downplay the fact that free inquiry and legitimate disagreement are a normal part of science. • Insist that mainstream Western science is completely objective, and is uninfluenced by covert beliefs, untestable assumptions, ideological biases, political pressures or commercial interests. If an unfamiliar or inexplicable phenomenon happens to be considered true or useful by a nonwestern or other traditional society, you may dismiss it out of hand as "anecdotal nonsense," "ignorant misconception," "medieval superstition" or "fairy lore." • Declare that individual temperament, personality type and human emotions exert no influence whatsoever on the objectivity of "real" scientists. Ignore the fact that the denial of emotions, prejudices, idiosyncrasies and plain old human insecurity can exert powerful subconscious influences on the scientific enterprise, often with hilariously unscientific results. • Avoid addressing the many historical parallels between the emergence of science and that of democracy, both of which originally rested on the revolutionary foundations of independent thought, honest inquiry, the free flow of information and the questioning of established authority. • Reinforce the popular fiction that our scientific knowledge is complete and finished. Do this by asserting that "if such-and-such discovery were legitimate, then surely we would already know about it!" • Assert that nothing can possibly occur that circumvents Newton's 17th-century formulations of physical law. If someone should remind you that the 17th century did not have the last word on physics, change the subject as deftly as you can. • Characterize any inquiry into a genuine mystery as "indiscriminate," while equating the summary dismissal of unorthodox ideas with "intelligent discrimination." • If someone reminds you that "in science, one point of view requires as much proof or disproof as another," invoke the irrelevant truism that "orthodox beliefs have already been proven!" • State categorically that the unconventional may be dismissed as, at best, an honest misinterpretation of the conventional. "intellectual integrity is a subtle issue!" • At every opportunity extoll the virtues of "critical thinking," while behaving as if the phrase means nothing more than ruthless negativity. Avoid explaining that critical thinking presupposes a willingness to examine all sides of an issue with equal rigor. Workers on construction sites, factories and warehouses might cope with aches and pains brought on by their work. Hopefully, the future will provide an easy answer for workers to suit up in a suitable way for them to avoid these aches and pain. There is a new kid on the block aiming to address such a solution, and a number of tech watchers have put them in the news this month. 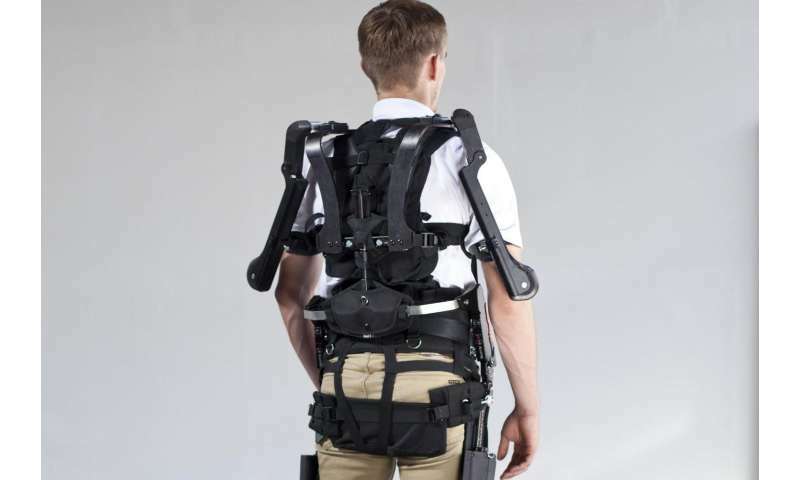 A California-based group aptly called suit-X announced its MAX, which stands for Modular Agile Exoskeleton. The company designs and makes exoskeletons. "MAX is designed to support workers during the repetitive tasks that most frequently cause injury," said a company release. Will Knight in MIT Technology Review said that this essentially is " a trio of devices that use robotic technologies to enhance the abilities of able-bodied workers and prevent common workplace injuries." Target users, for example, could include those who carry out ceiling inspections, welding, installations and repairs. "It's not only lifting 75 pounds that can hurt your back; it is also lifting 20 pounds repeatedly throughout the day that will lead to injury," said Dr. Homayoon Kazerooni, founder and CEO, suitX. "The MAX solution is designed for unstructured workplaces where no robot can work as efficiently as a human worker. Our goal is to augment and support workers who perform demanding and repetitive tasks in unstructured workplaces in order to prevent and reduce injuries." 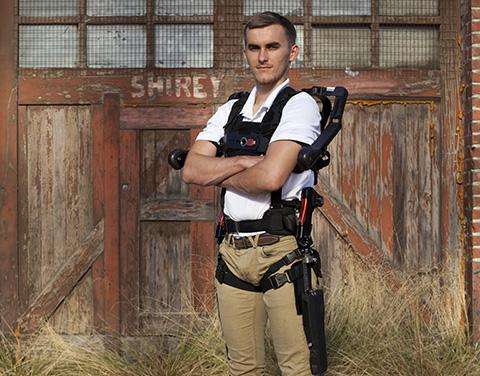 Seeker referred to the MAX system as an exoskeleton device that could potentially change the way millions of people work. 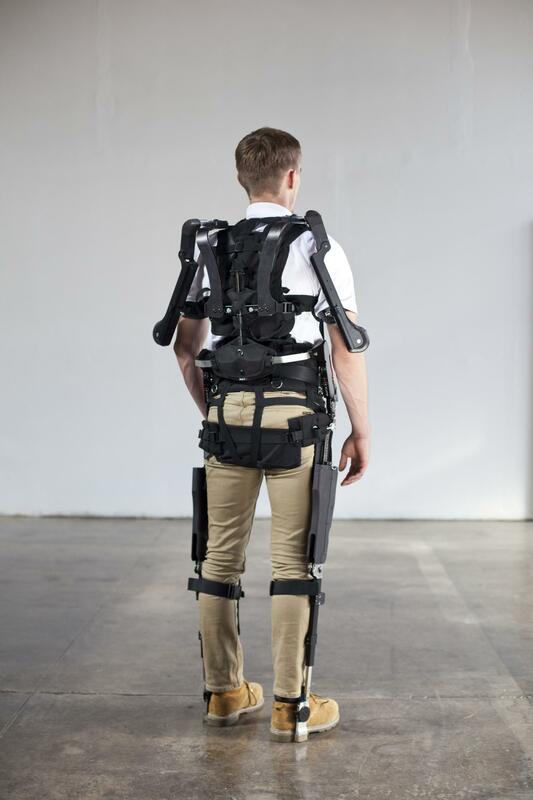 Seeker noted its advantages as workplace exoskeletons in several ways, being lightweight such that the user can walk around unimpeded. 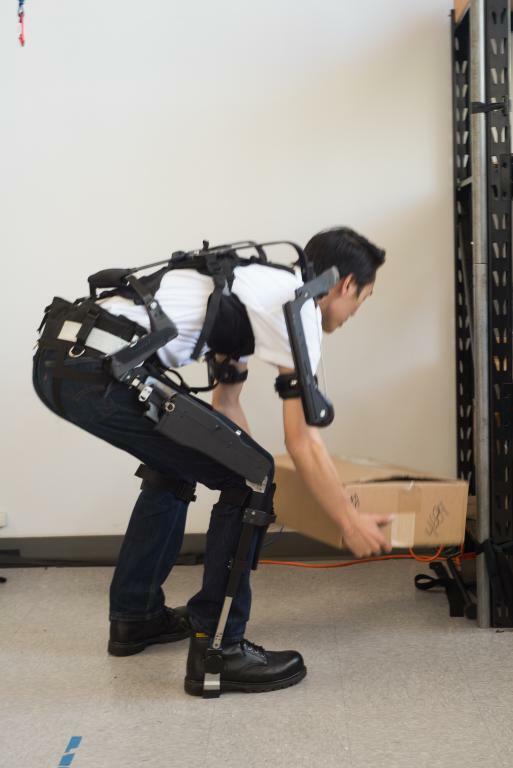 "The exoskeleton units kick in only when you need them, and they don't require any external power source." MAX is a product with three modules. You use them independently or in combination, depending on work needs. The three modules are backX, shoulderX, and legX. According to the company, "All modules intelligently engage when you need them, and don't impede you otherwise." The backX (lower back) reduces forces and torques. The shoulderX reduces forces; it "enables the wearer to perform chest-to-ceiling level tasks for longer periods of time." In a video the company defines shoulderX as "an industrial arm exoskeleton that augments its wearer by reducing gravity-induced forces at the shoulder complex." The legX was designed to support knee joint and quadriceps. It incorporates microcomputers in each leg. They communicate with each other to determine if the person is walking, bending, or taking the stairs." Seeker said these communicate via Bluetooth, monitoring spacing and position. Kazerooni spoke about his company and its mission, in Seeker. "My job is easy. I sit in front of a computer. But these guys work all day long, put their bodies through abuse. We can use bionics to help them." He also said he and his team did not create this "because of science fiction movies. We were responding to numbers from the Department of Labor, which said that back, knee and shoulder injuries are the most common form of injuries among workers." 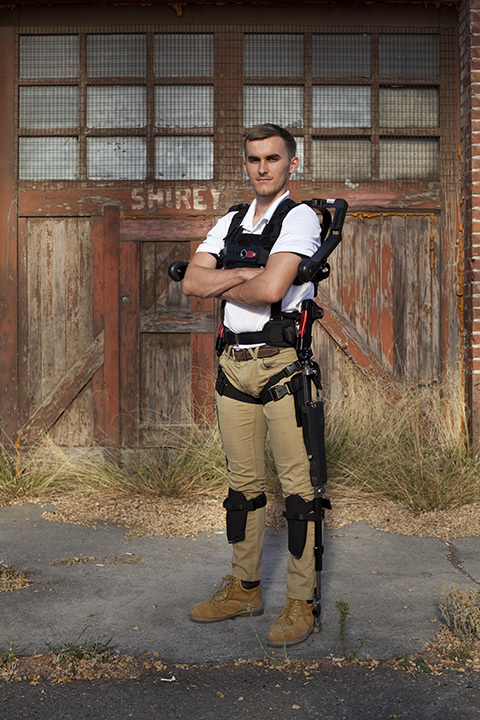 Will Knight meanwhile has reflected on the bigger picture in exoskeleton developments. Can they help in preventing injury on the job and help prolong workers' careers? 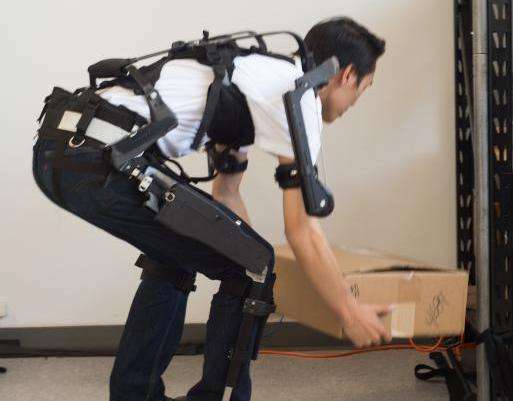 "New materials, novel mechanical designs, and cheaper actuators and motors have enabled a new generation of cheaper, more lightweight exoskeletons to emerge in recent years," he wrote. "For instance, research groups at Harvard and SRI are developing systems that are passive and use soft, lightweight materials." Some companies, such as BMW, said Knight, have been experimenting with exoskeletons. "The MAX is another (bionic) step toward an augmented future of work." Mayito... Mayito7777: I thought the guy look like EA so that is why I asked if anyone knew about him. I Am a mover who posts on the hidden mission after a hard days work. All of a sudden after all these years...I just might not wait in line for you to punch your timecard. Now, I wanna know who the hell we think you are mayito. Don't go runnin' off now @ the mouth or from our scrutiny. I don't own any sheep and this ain't your mutiny.